William Crookes was born on 17 June, 1832 in London . He studied at the Royal College of Chemistry and became one of the most important scientists of the XIX century, both in the field of Physics and in Chemistry. He combined private experimental research with business. He also edited several photographic and scientific journals. Having inherited a large fortune from his father, he devoted himself from 1856 entirely to scientific work of various kinds at his private laboratory in London . In 1861, he discovered the metallic chemical element thallium. This led him indirectly to the invention of the radiometer in 1875. He later developed a vacuum tube (the precursor of the X-ray tube). His studies of cathode rays were fundamental in the development of atomic physics. He was knighted in 1897 and received the Order of Merit in 1910. He was also a Fellow of the Royal Society, becoming its president between 1913 and 1915. Spiritist phenomena were very much in evidence at the end of the XIX century. After the events involving the Fox sisters of Hydesville, in 1854 in the United States , there appeared several mediums displaying the most incredible phenomena like, levitations, rappings, the spontaneous playing of instruments, materializations, etc. Therefore, William Crookes, as a scientist of international repute, decided to investigate Spiritualism. He was initially very sceptical about it. He explained the reasons for his inquiry: ‘I consider it the duty of scientific men who have learnt exact modes of working to examine phenomena which attract the attention of the public, in order to confirm their genuineness or to explain, if possible, the delusions of the dishonest and to expose the tricks of deceivers’. By his own account Crookes had originally, ‘like other men who thought little of the matter and saw little’, taken Spiritualism to be superstition and trickery; he stressed that his aim would be to substitute a strictly scientific appraisal ‘for the loose claims of the pseudo-scientific Spiritualists’. He began by studying one of the most famous mediums of all time, Daniel Dunglas Home, and was soon convinced that Home was endowed with a powerful psychic force. Many believed that Crookes would expose the phenomena he witnessed, but this rapid conversion to the ranks of believers surprised the public and shocked his scientific colleagues. Yet he undertook all his experiments under strict scientific conditions, whenever that was possible. He devised instruments to preclude any possible claim of forgery. For example, he had a wire cage made and inside it, he put an accordion he had bought himself. Home just placed his hand on the cage and the instrument started to play a well-known tune. The experiments that made him really famous were with the medium Florence Cook, at the time, only a teenager. Through her mediumship, there occurred a series of materializations of the Spirit Katie King, which lasted almost three years. Just before the Spirit stopped appearing, Crookes obtained a total of 44 photographs, among which were, according to him, ‘some inferior, some indifferent, and some excellent’. 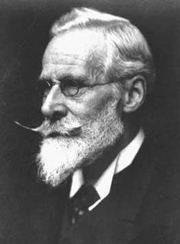 Sir William Crookes died in London on 4 April 1919 . Encyclopedia Britannica, the Oxford Talking Dictionary.